The Filmmaker’s Guide to Visual Effects offers a practical, detailed guide to visual effects for non-VFX specialists working in film and television. In contemporary filmmaking and television production, visual effects are used extensively in a wide variety of genres and formats to contribute to visual storytelling, help deal with production limitations, and reduce budget costs. Yet for many directors, producers, editors, and cinematographers, visual effects remain an often misunderstood aspect of media production. In this book, award-winning VFX supervisor and instructor Eran Dinur introduces readers to visual effects from the filmmaker’s perspective, providing a comprehensive guide to conceiving, designing, budgeting, planning, shooting, and reviewing VFX, from pre-production through post-production. See visual effects concepts brought to life in practical, highly illustrated examples drawn from the real-world experiences of industry professionals, and discover how to better integrate visual effects into your own projects. "The Filmmaker’s Guide to Visual Effects is a unique and essential guide for filmmakers and producers to navigate the complex world of VFX to effectively make better films. 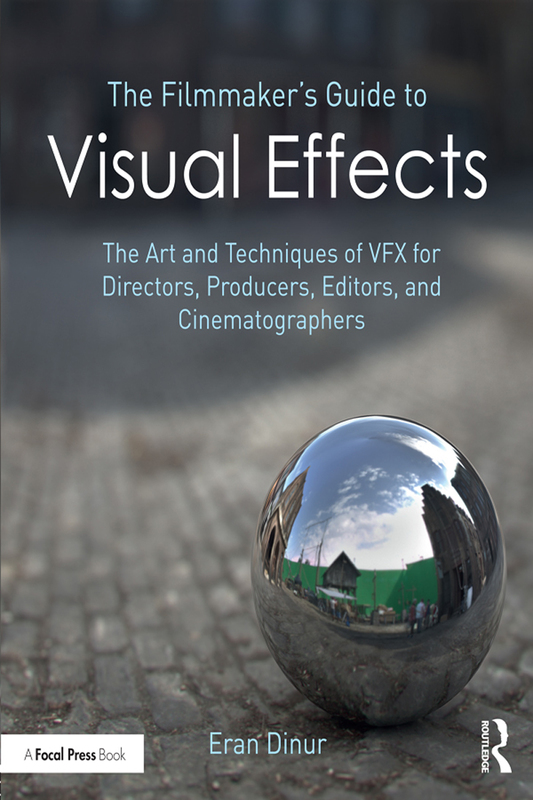 You need to read this book if you are a filmmaker that needs a simple or complex visual effects shot; your film will be better, and it will be completed sooner and it will cost less if you understand how to work with VFX." "The Filmmaker’s Guide to Visual Effects is an indispensable tool for filmmakers. Writing in a clear, concise style, the author makes the possibilities of VFX accessible to directors, producers, editors, cinematographers – anyone who wishes to know more about how to use its power to better tell their stories." "This book should be required reading for anyone working as a director, producer, DoP and many other roles, as well as film students. Working in the industry gives a fragmented familiarity with lots of VFX in practice; this book completes the picture and gives me – as a director, producer and First Assistant – a coherent view of why we use certain methodologies and how we can then envision and plan ambitious effects while saving time and money. An extremely useful resource that I’m sure I will return to again and again." "While there are many good VFX books out there aimed at the VFX artist, The Filmmaker’s Guide to Visual Effects fills a niche in providing filmmakers a comprehensive overview on how to successfully implement VFX techniques in their productions." Eran Dinur is an Emmy and VES award-winning VFX supervisor, artist, and instructor. His work at ILM Singapore includes films such as Iron Man, Star Trek, Transformers: Revenge of the Fallen, Indiana Jones and the Kingdom of the Crystal Skull, and Terminator Salvation. Since 2011 Eran has served as the VFX supervisor of NYC-based company Brainstorm Digital on numerous film and TV projects, including The Wolf of Wall Street, Boardwalk Empire, The Lost City of Z, Café Society, Nerve, Delivery Man, The Heat, The Men Who Built America, and The Immigrant. Eran won a Primetime Emmy Award as well as two Visual Effects Society Awards for his work on Boardwalk Empire. Eran teaches VFX production skills at the School of Visual Arts, has created popular online courses at fxphd, has written numerous articles for 3D World Magazine, and has presented at various international conferences including SIGGRAPH, NAB, and Mundos Digitales.